The Payments page can be found in wp-dashboard→User Frontend→Settings. The Payments page lets you tweak several options relating to subscriptions, currency, prices, and transactions with your users. Enable Payments: Check this box when you want to enable charging for your posts. This is a global setting. In order to be able to charge for one or more posts in your site, you need to enable this checkbox first. Subscription Pack Page: From this drop-down select the page where [wpuf_sub_pack] is located so that users can be redirected accordingly. Subscription at registration: Enable this checkbox to redirect new users to subscription page when they are about to register. Currency: Select the global currency you want to apply for all your payments and transactions purposes from this drop-down. Currency Position: Select the currency position for subscription packs. Thousand Separator: This field sets the thousand separator for displayed prices (e.g. 1000,00 or 1000.00). Decimal Separator: This field sets the decimal separator of displayed prices. Number of Decimals: This numeric field sets the number of decimal points that will be shown in displayed prices. 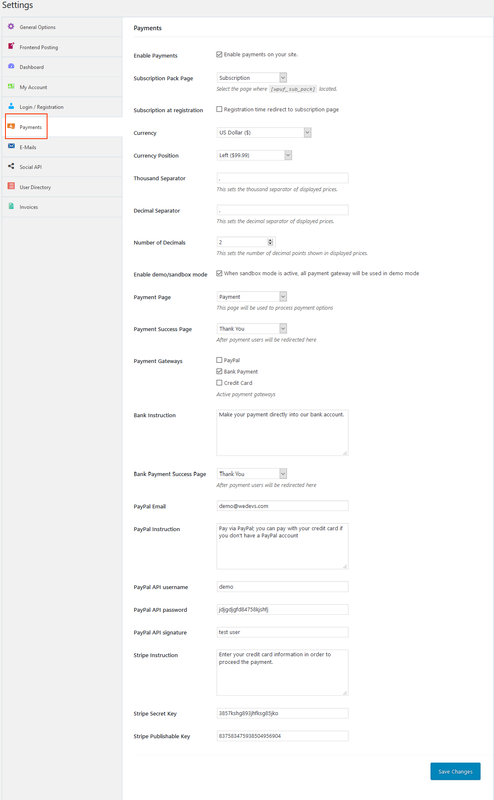 Enable demo/sandbox mode: When you are testing your site, enable this checkbox to use all payment gateway in demo mode. Payment Page: Select from this drop-down the page that will be used to process payment options. Payment Success Page: Select from this drop-down the page that users will be redirected to after payment. Payment Gateways: These are the payment gateways on your site. Enable from this checkbox the ones you want to be active. Bank Instruction: In this field type the message you want to show your users when they make Direct Bank Payment. Bank Payment Success Page: From this drop-down, select the page users will be redirected to after payment. PayPal Email: Type your PayPal Email here. PayPal Instruction: In this field type the instruction you want to give to your users when they want to use PayPal. PayPal API username: In this field type your PayPal API username. PayPal API password: Here type your API password. PayPal API signature: In this field type your API signature. If you have the Stripe Connect module enabled, you will get the following 3 options below the Payments page. Stripe Instruction: Enter any instruction for your users. Stripe Secret Key: Obtain the Secret Key from your Stripe Account and enter here. Stripe Publishable Key: Obtain and type the Publishable Key to connect with your Stripe Account.